Crane goat manual loading capacity 0, 5t. height of rise is 5 m flight of 4 m for a raising and movement of freight to any and convenient place. Gantry cranes are used for lifting and transport operations in the construction, installation and repair of equipment, loading and unloading various cargos. Gantry cranes are installed on open storage and installation construction sites. 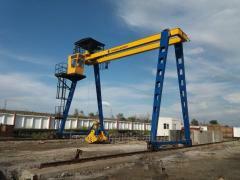 Unbelievable price on Trestle cranes in Zaporozhe (Ukraine) company Zavod Krankomplekt, OOO (Kranovyj Zavod). Wide choice of quality products at affordable prices.